WOW was I pleased to receive an email from Earles McCaul a few days ago. Earles is the author a book in our "Blacksburg Continuing Education Series" published 32 years ago in 1981. 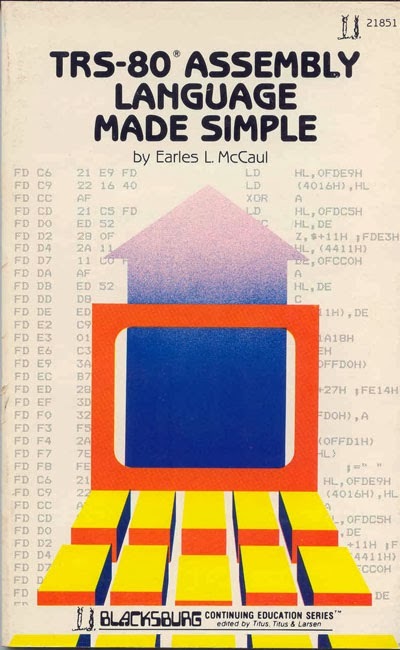 His book "TRS-80 Assembly Language Made Simple" was very popular. Earles describes how he wrote the book by working with John and Chris Titus in the Blacksburg Group. I have not seen this process in print before and I outlined this section of Earles story in red. I have not modified his writing here and it is a great story as he tells about writing the book and how it helped him get some very interesting job offers. This is a great personal success story. Modern cyber technology can be wonderful - you can see and read Earles whole book on line or download a pdf file link at end of story. I had already been teaching electronics (basic transistors) and automotive technology (electronic ignition systems) night courses for over four years as an adjunct instructor at Arizona Western College, Yuma, AZ, when the microcomputer ‘craze’ snowballed into Yuma. At that time computers were under the prevue of the math department, not the electronic department…but, that would soon change. By 1976, I had already read Jonathon Titus’s article, “Build The Mark-8: Your Personal Minicomputer,” in the July 1974 issue of Radio-Electronics magazine and was well aware of the many “how to” technical books that Howard W. Sams & Co. published -- I used many of their books in my different classes . And, I was interested in learning digital electronics (fundamentals learned in USN electronics schools) and programming (knew nothing). By late 1978 a small number of ‘home computer’ enthusiasts were meeting monthly at a local electronics surplus store; those meetings evolved into my forming The Yuma Computer Club. There were many enthusiasts but, initially, there were only three computers – an Altair 8800 that Ken Knecht had built; a Commodore PET that a retired doctor (don’t recall his name) had just bought; and a KIM-1 prototyping system that Thormon “Thor” Ellison used in his work as an engineer at the U.S. Army Yuma Proving Ground (YPG). So, when Tandy Radio Shack announced their TRS-80 microcomputer in November 1977, I was one of the many who immediately placed an order. The local Radio Shack manager later told me that my order had been escalated because I had checked the “College Professor” box on the order form. I don’t know if that was truly true, but I did somehow manage to get one of the first 3,000 TRS-80s produced when it arrived mid-December...supposedly (unconfirmed) one of first sold in Arizona. At that time, the only TRUE computer science courses that AWC taught were FORTRAN, COBOL and BASIC—all on a PDP-11 (purple & black) mainframe. But, soon people (Yuma has a HUGE influx of ‘retired’ winter visitors) began asking for courses applicable to their “new” PET, Apple II, Atari, and TRS-80 home computers. 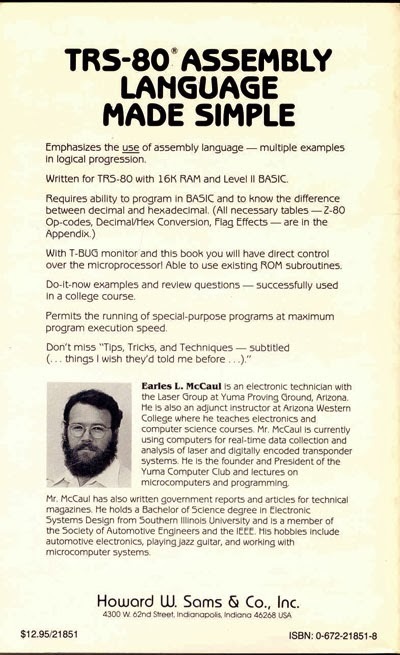 AWC responded by offering two microcomputer programming courses: BASIC (for Apple II, PET, Atari and TRS-80) and BINARY (actually, an 8080 microprocessor machine-coding course). So, I proposed an intermediary “simplified” Assembly Language course (on TRS-80), which—much to my surprise— the AWC Curriculum Committee accepted; but only on the condition that a suitable textbook be found and used...a process that lead me to The Blacksburg Group. After contacting all the ‘known’ publishing houses and finding nothing suitable, I then contacted The Blacksburg Group. Their immediate response was (paraphrased): “Well if *WE* don’t have it, would *YOU* be interested in writing it?” This unsolicited offer literally floored me. I was initially hesitant to accept the offer, having never written a book before, but Jonathon Titus assured me that with (a) my knowledge of the subject and (b) my prior writing experience of having written four technical “Auto Shop” articles for HOT ROD Magazine and numerous government technical proposals and documents, that he was willing to *coach* me through the process. I CAME to Blacksburg Group looking for a book, but ENDED up becoming its author – talk about serendipitous luck! My writing process began with the submittal, to Jonathon and Christopher, of my proposed course outline that the AWC Curriculum Committee had approved; they accepted it too. So, I next mapped out my writing strategy -- a chapter a month; 9 chapters in 9 months. I allotted one week for the initial (throw it on the paper & see what sticks) draft; the next two weeks for clean-up, verification and illustrations; and the last week for finalization...and, surprisingly, I was largely able to maintain that schedule, in spite of both maintaining a full-time job (40 hours plus overtime) at YPG and teaching three weekday night courses at AWC. But we were ALL strong and invincible in our youth, weren’t we? Each month, I mailed a new chapters’ manuscript package to Jonathon and Christopher for their editorial review and comments and they would send me back their markups (in red pencil or ink...which always evoked memories my high school English papers!) of that chapter. Each and every page they sent back was kept in a large 3-ring binder that I called my “Humility Book,” because it truly was humbling to realize that while I might KNOW the subject, I was not all that great at committing that knowledge to paper. Today, that binder still proudly sits on my bookshelf, reminding me of both my success (published book) and my humbling (writing may not be easy, but it CAN come with guidance and practice)! Second only to the day that I opened the box containing the first copies of my finished/published book, was the night (about 10 pm MST) that I received a telephone call — ‘out-of-the-blue’ — from Christopher Titus, who was apparently working very late (1am EST?). We talked for more than an hour—more about our computers than about my book. I still cherish that un-expected, personal, one-on-one, late night conversation with him. One of the best received portions of my book (by book reviewers) was Chart 8-1. Tips, Tricks and Techniques (...things I wish they’d told be before...) which must be rightly credited to the unknown student who quipped “...wish they’d told me that before!” The other well-received portion was the Appendix A – Recommended Reading List, which listed the most popular (and obscure) TRS-80 books available...the collective knowledge of many others! At that time, my home library contained over 300 books and magazines on microcomputers (Apple, Altair, Commodore, Heath-Kit, KIM-1, TRS-80), microprocessors (8008, 8080, Z80, 6800, 6502, 6100/PDP-8, 1802), and programming (BASIC, Pascal, FORTRAN, COBOL, Ada, Forth, CP/M) and pretty much consumed one whole wall of our garage (my wife had to inventory every one with the movers when they moved us from Yuma to Tucson). My book neither invented nor created anything new, it just distilled and simplified what many others were similarly doing. The only thing unique was its specific application of teaching and using Assembly Language programming on the TRS-80 Model I microcomputer. In late 1981, Mike Faulk, an engineer with Hughes Aircraft Company, with whom I worked at YPG, suggested I submit a job application to Hughes Aircraft Company because they were looking for people with microcomputer experience. I received a positive reply and job offer from their home office in Canoga Park, CA, but I was not very keen on the idea of moving to the LA area. So, Mike asked if I might be interested in working at their missile manufacturing facility in Tucson, AZ, which sounded much more appealing (to my wife and I). He then asked for a copy of my book and slid a copy of my resume and Hughes application form between its pages and took it back to Tucson with him. A week later, I received a telephone call from Mike telling me to ignore the Canoga Park offer; a new offer was in the mail from Tucson. So, on August 2, 1982, I happily accepted an engineering position as a Member of the Technical Staff (MTS) in the Environmental Test Laboratory (ETL) of the Missile Systems Division (MSD) of Hughes Aircraft Company at Tucson, AZ. My job was to design microcomputer-based data collection and analysis circuits, hardware and systems, which were used on just about every missile and product that Hughes manufactured. Jokingly, the ETL was referred to as the “...shake, bake and break...” laboratory—because that’s what we did—test things until they broke! Then we determined *why* it broke and my instrumentation systems gathered and collected the data used to analyze *why & how* those things broke. Initially we assembled and used various S100 (Z80) systems with custom-designed adapter-boards to accommodate whatever processor(s) the product required (such as TI 9989 in TOW ). Eventually, however, following IBM’s release of their PC-XT in March 1983, we slowly migrated away from Radio Shack computers and began using IBM PC’s because of their standardized architecture. For example, one system that I designed, the Hughes TOW Data Acquisition System (TDAS), actually began using a TRS-80 Model 100 (Kyocera) laptop computer (and cassette tape deck!) but was later upgraded to an embedded SB-180 single-board computer because of the need for more memory and compatibility with MS DOS and Windows programming [pix available of both units]. In addition to my engineering and management assignments, I was briefly able to revisit my “lecturing” role when I was nominated to become a Hughes’ Advanced Technical Education Program (ATEP) instructor, where I taught college-level, after-hours, courses on microprocessors and digital circuit design to cross-disciplined engineers. Later, I also guest-lectured on “digital data acquisition & analyses processes,” when other instructors taught their FFT courses. Twenty-eight years later, I retired from Hughes/GMHE/Raytheon. Brice Ward, Transistor Ignition Systems Handbook, 1969, #20238, Howard W. Sams & Co.
R. F. Graf and G. J. Whalen, Solid-State Ignition Systems, 1974, #21049, Howard W. Sams & Co.
 Tube-launched, Optically-tracked, Wire-guided (TOW), anti-tank missile. I have had contact with a few authors of books in our old "Blacksburg Continuing Education Series" . It is very interesting to hear about the past 30 years of their life and career. Most of course were associated with the electronics or the computer industry. A few started their own company's and all seem to have had been successful and had many happy years.